Today was my 2nd day of the season to fish for winter trout in Clearwater Lake. Sam and I fished there on December 4th and had a nice day, albeit a bit cold. Well, it was much warmer today, but the forecast all week had been for rain today and that was the case! The old Seattle Sombrero came in handy. Got there about 9:45 am (nice to have a leisurely breakfast and still go trout fishing!). I caught several, almost all on a Tellico dropper under a white bugger. Nice, fat fish like this one. After lunch, we decided to try our luck on the risers, using tiny black midges (#20) that were coming off regularly. 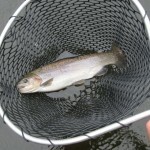 Fish were breaking everywhere, including many large trout completely clearing the water. Sam did very well, landing about 5. I hooked 2 or 3, but not well enough to land…that part of my mojo wasn’t working, but it was great fun casting to the riseforms and watching the fish take the fly. I decided to leave about 4PM, and just in time. While the rain had been steady through lunch, it had stopped about 1PM and often the wind was not blowing. That’s helpful for fishing tiny dry flies. I noticed the sky getting darker, and packed up the truck. A couple of minutes later I was driving home through pouring rain. A great day, tho! Looking forward to getting out and catching some hickory shad in a couple weeks. Stay tuned for that. 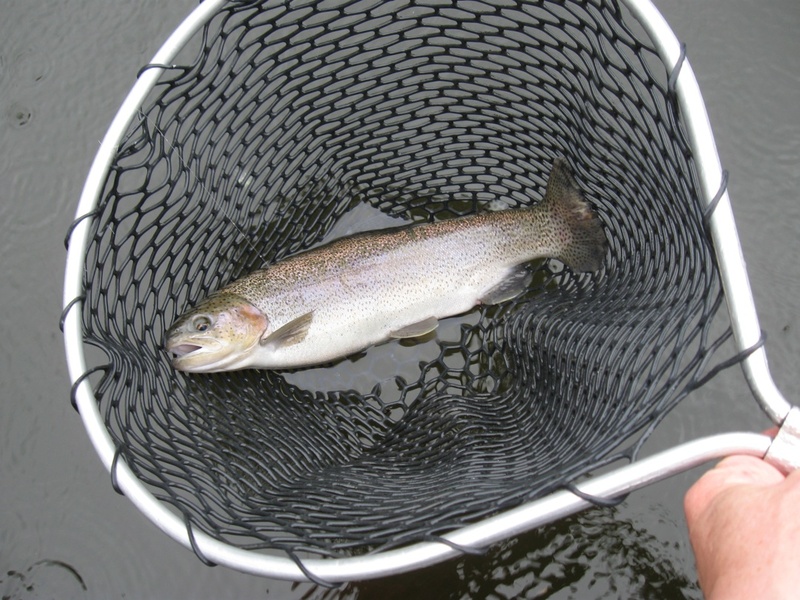 This entry was posted in Flyfishing on March 6, 2011 by joel.